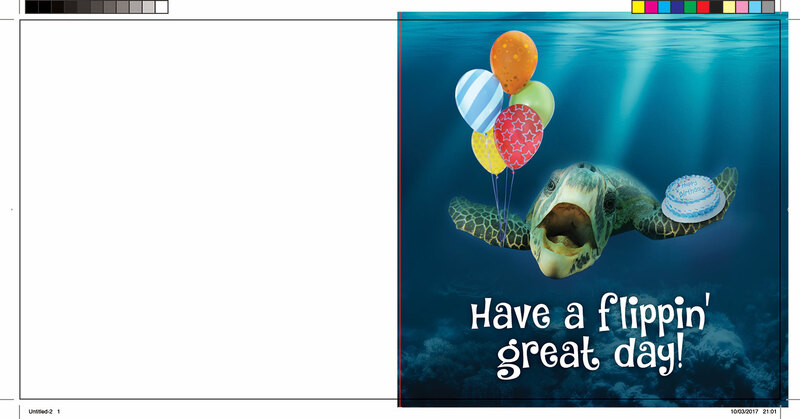 This post is the first in a series of how to design your own greeting card for print, though in truth these principles apply to the majority of professionally printed products. If you’re looking to design your own greeting card for the purpose of going into production, then it’s important to prepare your artwork to the correct standard. The greeting card design market has exploded with the advent of short-run printing at an affordable price. Now everyone can enjoy the possibility of seeing their own card ideas in glorious print, and ready for sale. This does mean that the market has a lot of greeting card designers vying for position, which of course means you need to ensure your product is as professional as possible to ensure you stand out from your competitors. Are you aware of the importance of bleed for any artwork that covers the page? This in particular catches out a lot of people. The bleed area refers to artwork that continues to the very edge of the card. If your artwork does not include a bleed area and finishes flush with the edge of the card, when trimmed you will very likely end up with white areas due to the card stock shifting. This is an example blank template. The black keyline denotes the trimmed area of the card, the red line shows the crease line. The blue area indicates the bleed area of the card, which extends 3mm (in all directions) beyond the finished card. Although this is a problem that can be solved in a lot of instances at the artwork preparation stage (in all but the most intricate of card design), it’s always prudent to design your own greeting card artwork initially to the required size including the bleed area (for example, a 150mm square card including a typical bleed area of 3mm would mean that your artwork size should be 156mm x 156mm). This image shows an example of how the artwork crosses over the crease line by 1mm, to ensure that the front of the card doesn’t have any white areas due to the card stock moving during finishing. And yes, that’s a Turtle – I’m keeping it relevant! When you place artwork over a crease, people (initially) tend to position flush with the crease. But in a similar method to trimming the card, this doesn’t allow for any movement during finishing. So, again, it makes sense to prepare for this. As a result, you should always extend the artwork by 1mm over the crease area. So, going back to our 150mm card example, the actual size of the finished artwork is 151mm by 150mm (when allowing for the crease). Of course, if your card front is not full bleed (doesn’t bleed off the page), then this isn’t important – but it’s always good to plan ahead. So I make it a habit to always start from the position that I may need the artwork to be full bleed. Amazing guide! Love this blog and I learned a lot. Thank you.